Handsome cowboy, meet ravishing ballet dancer. Hunky cowboy Clyde Walker grew up on a horse ranch working side by side with the rough and tough men that ran the place. When Clyde moved east for grad school, he didn't expect to find romance with the type of guy more comfortable in tights and ballet slippers than in jeans and workboots. Bonaventure “Bonnie” Rinaldi is jaded to pretty boys. 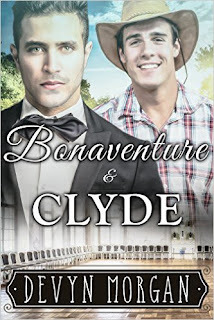 However, as a favor to his best friend during an event at a snotty country club, the stunning Bonaventure becomes Clyde’s guide and dinner companion. Bonaventure discovers that chaperoning the smoldering stranger through the event is a nicer duty than most – Clyde is genuine, magnetic, refreshing. Bonaventure and Clyde is a gay romance with happy ending, no cliff hangers, and explicit material. I approach Devyn stories expecting a light interlude, and here, I got lightness and happiness. Clyde (poor guy, that name!) is a cowboy with wonderful manners, his sense of social nuance is actually amazing. And so are his buns in black leather. Bonnie’s the son of a socialite family, who probably thinks he’s slumming to be a professional dancer. They don’t have much problem with his orientation or what he does with whom, and this very sense of blasé makes for some humor. The men were on very different paths when they met, but they’re willing to make major changes to be together. This comes across more as logistics than conflict. Given the activities of the original Bonnie and Clyde duo, I was expecting something with crime, which doesn’t have anything to do with this story. I’m not sure if this was a wasted opportunity or a lesson to the reader about making assumptions, but the story doesn’t involve desperadoes, only desperation to be together again.